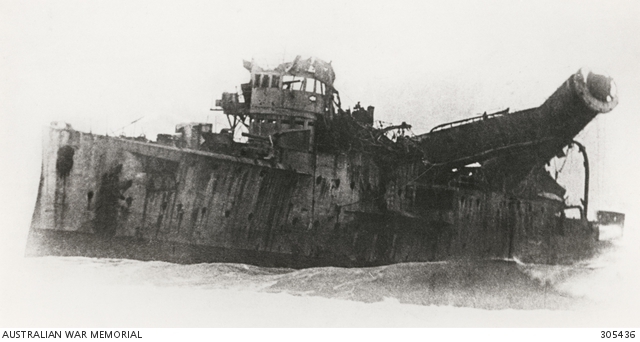 The wreck of the German light cruiser SMS Emden after her action with HMAS Sydney, 1914. Image courtesy Australian War Memorial. Since the beginning of the war SMS Emden, under the command of Captain Karl Friedrich Max von Muller, had been patrolling the Indian Ocean threatening British and Allied interests. Between August and October 1914, Emden captured or sank 25 civilian vessels, destroyed two Allied warships at Penang and shelled Madras. The vessel was clearly a threat to the convoy transporting the first contingent of Australian and New Zealand troops that had set sail from Albany on 1 November. HMAS Sydney was one of four vessels escorting the convoy of ships, however, on the morning of 9 November, left the convoy to investigate a distress call from a British wireless and cable transmission station on Direction Island in the Cocos (Keeling) Islands. At 9.15am Sydney surprised Emden, which despite being over 9km distant, proceeded to open fire with long-range guns. Sydney advanced, and began firing shells at 8.7km. At 5km she started firing torpedoes, damaging Emden’s wireless and steering equipment and rangefinders. The ship’s funnels and foremast collapsed as fire took hold of the engine room. At about 11.20am Emden ran aground and Sydney ceased fire. The battle resulted in 134 German sailors killed, 69 wounded and Captain von Muller and 156 other survivors taken prisoner. The Emden managed to strike Sydney, killing four Australian sailors and wounding sixteen. Confirming the Australian victory, the captain of Sydney – Vice Admiral John Collings Taswell Glossop – cabled ‘Emden beached and done for’ to the Department of Defence. The Battle of Cocos was an emphatic first victory at sea for the recently-formed Royal Australian Navy; Australia had put an end to the Emden’s dominance in the Indian Ocean and ensured safe passage for the 1st Australian Imperial Force convoy. This entry was posted on November 9th, 2014.